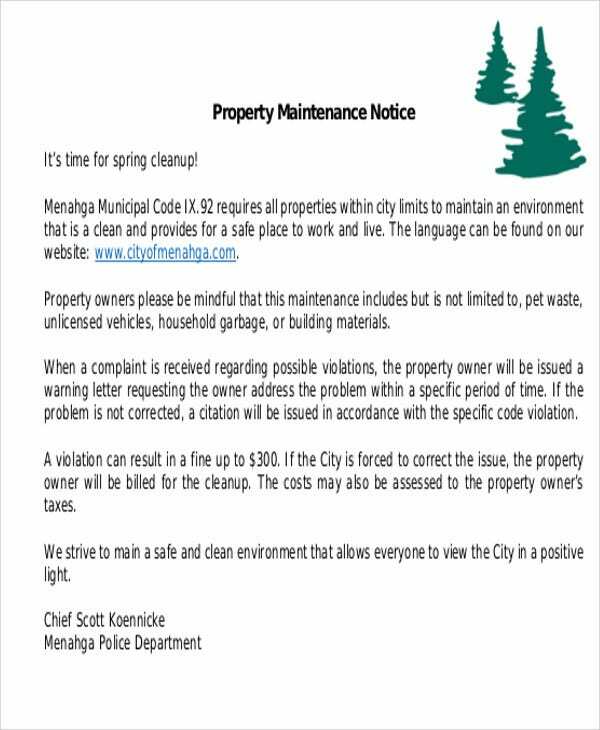 A maintenance notice is usually a formal document to remind or announce designated recipients about matters relating to property or equipment repair and check up. 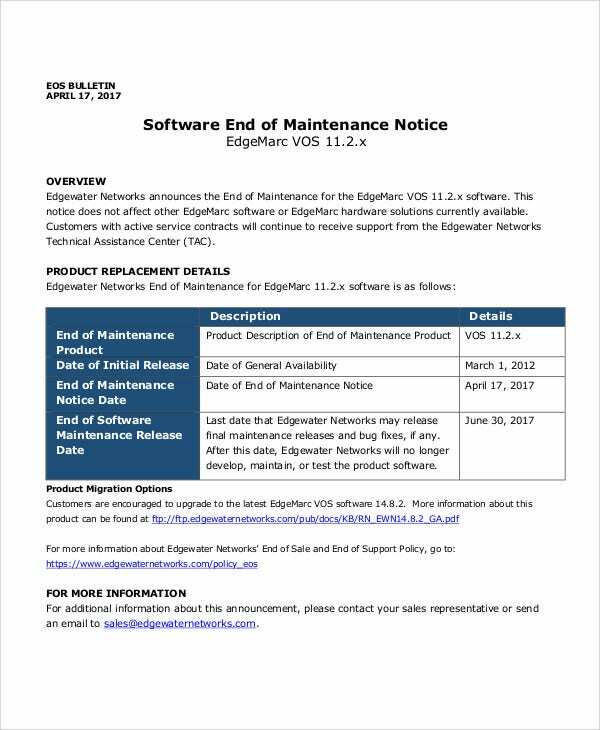 Often, a maintenance notice template is used so as to be consistent with format and structure of the information to be related and made known of. 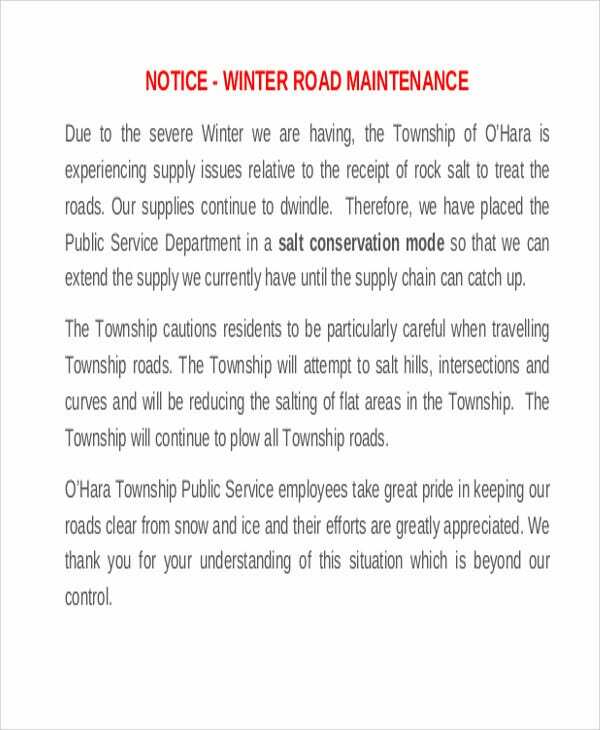 It is a management prerogative to inform through maintenance notice and it is expected to be disseminated well to people concerned. 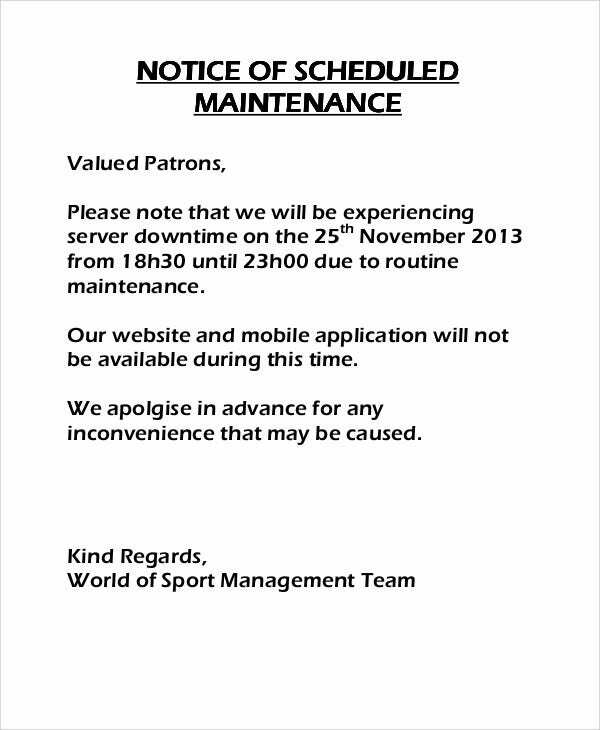 Maintenance service contractors also take charge of providing maintenance notices to their clients. Quitting without notice may be subject to due sanctions that may hamper property and equipment operations. Maintenance and repair service could be a broad term. 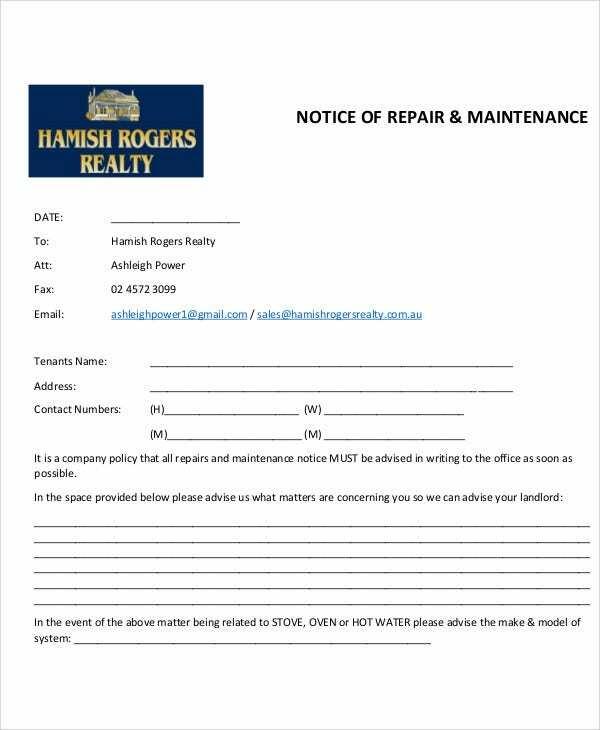 A maintenance service agreement is then deemed to differ according to an array of specifics depending on anyone who asks for it. Identify parties in the agreement. The agreement should contain the party who requests for the services and the party who’s assigned to render maintenance services. Identification details should be at the beginning of an agreement. Sample notice templates in Word suggest that party information should be concisely written. Specify scope of maintenance services. The agreement should contain the finalized terms and conditions regarding the scope of the maintenance services to be rendered. Should there be prohibited services to be undertaken, warning notice templates could be of good use to establish further warning guidelines. Provide an agreed service time frame. This is to specify contracting parties about how long operations are deemed effective to achieve desired results. 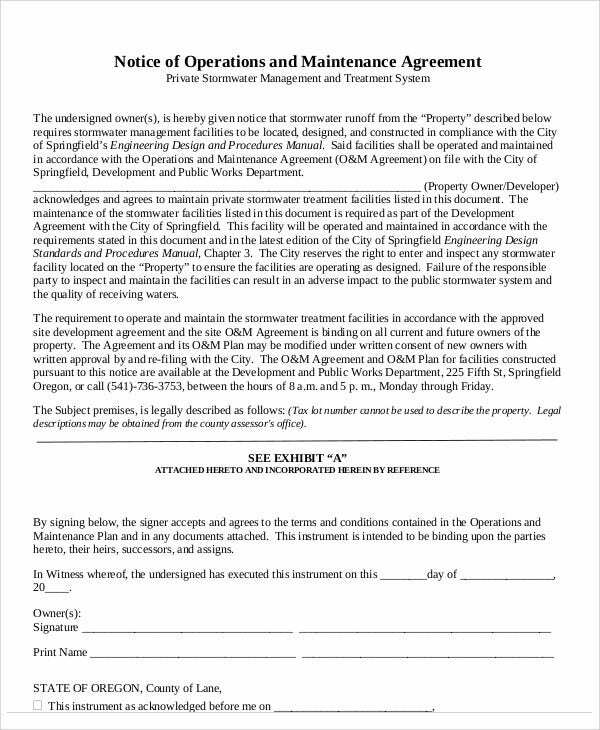 Often, an eviction notice template is utilized by property and equipment owners whenever maintenance service contractors are no longer needed for certain operations. Tenancy and space rental is most rampant nowadays. With instant flats and places to stay, it is mostly the responsibility of respective landlords to look after maintenance concerns and address these properly. 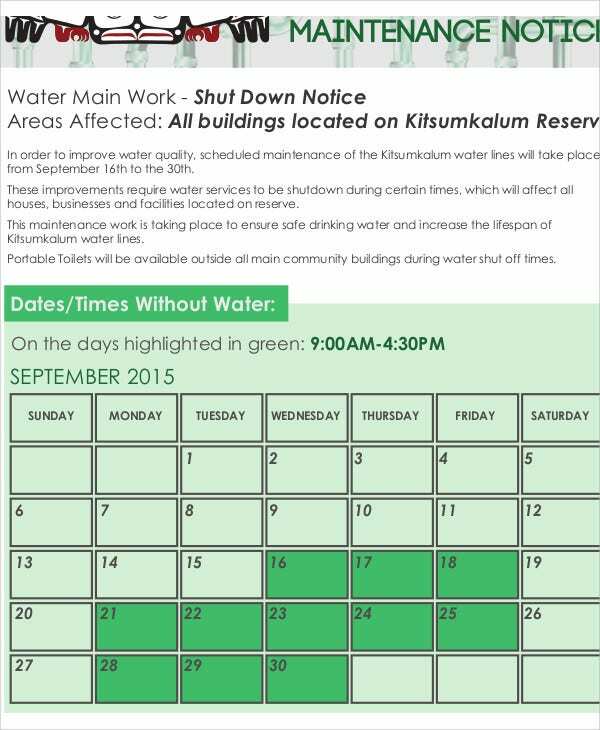 Have a list of maintenance services for emergency purposes. It is important to have an instant hand to help in times of emergency and unexpected circumstances. It may be very inconvenient to tenants but see to it that as a landlord, you have instant assistance that’s only a call away. Conduct a regular tenant occupancy assessment. Tenants would definitely know what needs to be repaired or in need of maintenance be it in specific rooms, bathrooms, or lawns. Landlords might not have the luxury of time to check on each tenant and so it would be advisable to cater on the maintenance demands of tenants beforehand. Do the standard property and equipment check. Landlords should not wait for tenants to put up complaints before they perform overall maintenance procedures. Every property as a whole and every equipment used should be checked based on standard procedures to ensure safety and tenant satisfaction for functionality. 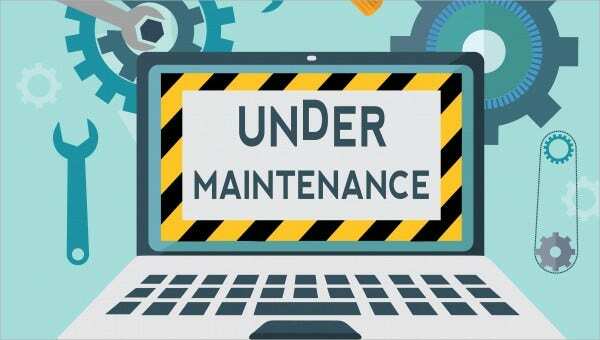 These share of maintenance tips could all be perfect content for free notice templates showcased in this page. 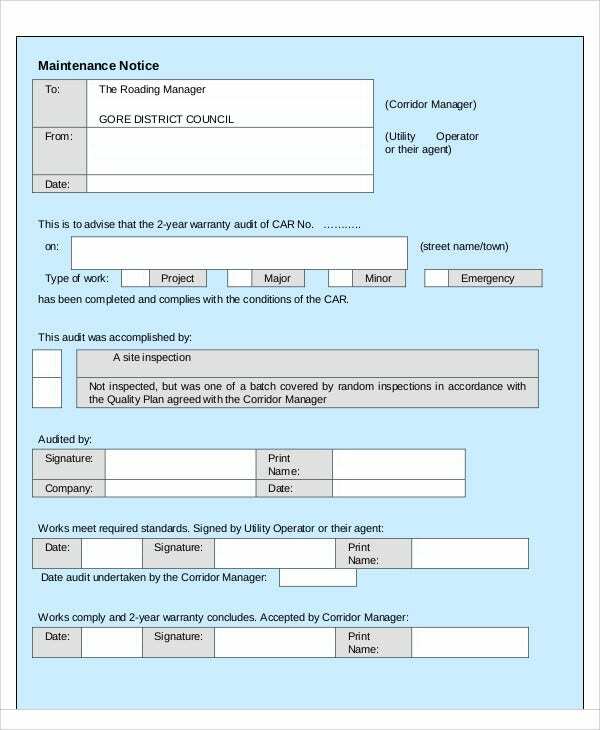 It would also be ideal for landlords to make use of a two weeks notice template for tenants to comply with what is asked before maintenance procedures take place.